Gernot Silvestri has been working in the Federal Computing Centre for 27 years. He started his career as a developer and currently leads the business unit Individual Applications (custom built applications). Gernot likes to refer to himself as a ‘trained lawyer’ and ‘self-taught IT-professional’. His business unit is responsible for the development, maintenance and operation of important Austrian Federal Administration IT-services. One of those important services is FinanzOnline, which is used by more than 4 million Austrians to do their tax declarations. He is also responsible for the entire IT-systems for the justice department. The Individual Applications unit of about 300 employees relies mostly on software development in Java. 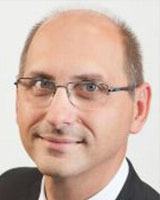 Nevertheless, some significant IT-services use PL/I, COBOL and .net.Gernot holds a higher academic degree (Magister) in law from the Johannes Kepler University in Linz.